The adjustable travel running belt by VerusLeo is a lightweight waist bag which can also be used as a money protector for travel. Made of premium quality neoprene, the body belt is breathable and keeps you comfortable when you're hiking, running, climbing, at the gym or just walking your dog in the park. The large waist running belt fits even the latest phone models. A fitness belt women and men will greatly appreciate, it's a must-have waist pack when you're on holiday or on your daily run. PROTECT YOUR BELONGINGS FROM MOISTURE: Made of high quality water-resistant neoprene, the VerusLeo workout belt makes sure your valuables stay dry, no matter the weather. Sweat resistant, the running belt neoprene ensures your possessions remain away from wetness when used as a fitness belt for women and men. SECURE YOUR TRAVEL DOCUMENTS: The running belt passport pocket allows you to take your ID card, passport and credit cards, your hotel room key with you when jogging or sightseeing. Fitting all of that and your money, the zippered pouches of this premium travel money belt make it the perfect travel wallet. STAY IN TOUCH WITH FRIENDS AT ALL TIMES: The VerusLeo waist pack for phone features a spacious phone compartment which will accommodate even the largest phone on the market. With a waterproof zipper, this workout phone holder is the ideal sport running belt to keep your phone within easy reach. PERFORM YOUR WORKOUT IN COMPLETE COMFORT: This waist pack running belt is slim and will hug your waist comfortably. Adjust the belt bag hook and loop closure to fit your size and you'll forget you're wearing it. With ingeniously-designed pockets to fit all your traveling essentials, this runners' pouch is built for long-lasting use. 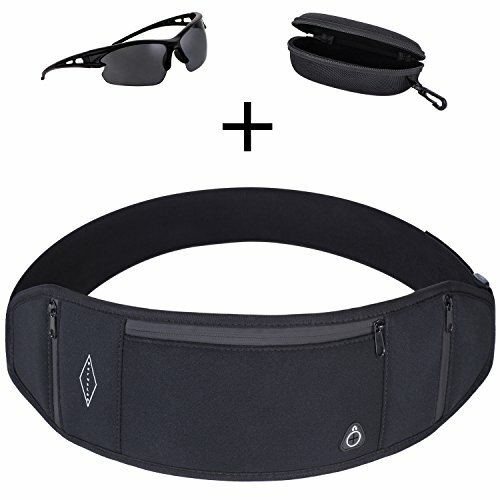 ALWAYS BE READY FOR A WORKOUT ON THE GO: The practical on the go belt is accompanied by a pair of sports sunglasses to protect your eyes while on a run in the sun. With a protective case, they all add up to an incredibly convenient fanny pack fitness kit. The pack for running belt is a wonderful gift for fitness and travel enthusiasts. If you have any questions about this product by VerusLeo, contact us by completing and submitting the form below. If you are looking for a specif part number, please include it with your message.